In recent years, practically all asphalt from roads and parking lots is being reclaimed and reused. One of the best ways to protect the environment is to recycle! It can’t be overstated how imperative it is not to let materials go to waste. The National Asphalt Pavement Association and the Federal Highway Administration partnered to survey the asphalt pavement production industry in 2009. Every year since they have collected importance statistics on the paving industry see if we are heading in the right direction. Back in 2002, The Federal Highway Administration made a policy that states that it would always recycle asphalt and other materials in roadways whenever its possible. Since then, we have seen a drastic increase in asphalt recycling. In recent years, practically all asphalt from roads and parking lots is being reclaimed and reused. 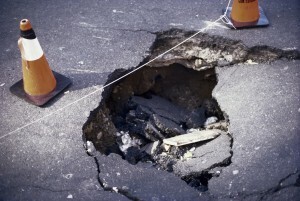 They have found that there has been an increase in both the use of recycled materials and warm-mix asphalt. The data also strongly indicates that asphalt pavement mixture gets recycled more than any other material. This is excellent news, and we at Reliable want to keep this trend ongoing for years to come. Reliable Contracting has an environmental commitment. We are always conscious of our impact on the environment with all of our projects. For example, we burn tons of recycled oil for fuel. We always try our best not to utilize additional amounts of fuel when it is not necessary. Also, Reliable Contracting is a proud innovator of many recycled materials. We recycle concrete and asphalt for base materials and even make our own asphalt paving mixes. Our warm-mix asphalt is a significant part of the green construction industry. We are happy to say that this type of asphalt is utilized for approximately a third of paving projects! It is also worth mentioning that it is a less expensive option because it requires fewer fossil fuels throughout the manufacturing process. Reliable is dedicated to delivering quality products, displaying professionalism within the firm, seeking new opportunities for expansion and profitability, and providing an environment for individual success. If you have a commercial or residential construction project that you need taken care of, please contact Anne Arundel County’s largest site-work contractor today by calling 410-987-0313 or visiting our website. You can also follow Reliable Contracting on Facebook, Google+, LinkedIn, Pinterest, and Twitter! Reliable Contracting Company serves the following and surrounding counties: Annapolis, Queen Anne’s, Anne Arundel, Baltimore, Baltimore City, Calvert, Caroline, Charles, Howard, Prince George, St. Mary’s, Talbot, and Washington D.C. This entry was posted on Thursday, January 25th, 2018	at 1:08 am	and is filed under Asphalt Paving	. You can follow any responses to this entry through the RSS 2.0	feed. Both comments and pings are currently closed.